Solar PV is such an adaptable technology, that an efficient system can be designed to suit most properties in the UK. Even if your roof isn’t suitable due to the shape or roof windows, there are alternative options through the use of ground mounted systems. Solar panels are by far the easiest way for a homeowner to generate their own clean electricity. If you’re interested in looking into solar in more depth, please see our free download ‘Size Your Solar’ which will enable you to take your first steps. When assessing the suitability of a property for a solar panel installation, we have several things to consider. As you can see from the solar radiation map (figure 1), your property will receive more solar radiation the further south you are. The South West is particularly well suited to solar PV and an unshaded installation can be expected to generate several thousand kWh per annum. 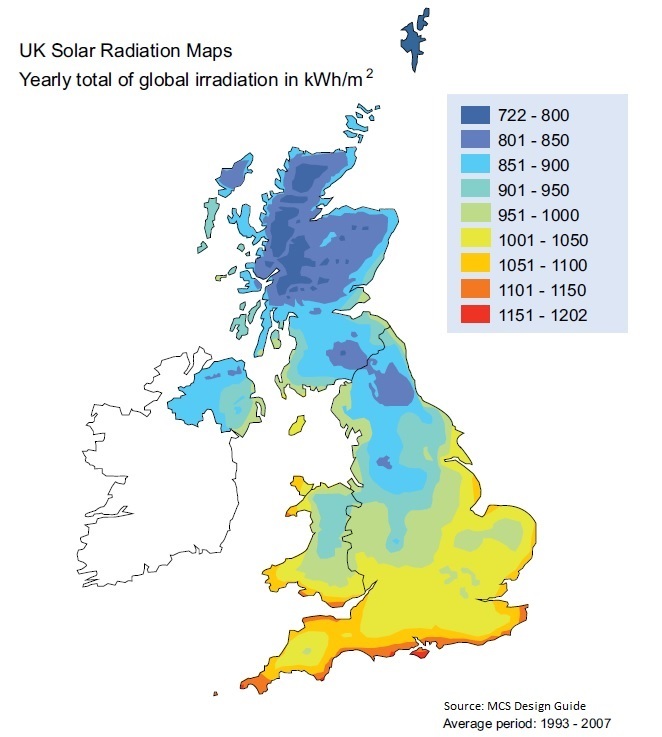 The UK is further broken down into irradiance zones, something that is considered when we design the solar energy system for your home. These irradiance tables are freely available as installer documents on the MCS (Microgeneration Certification Scheme) website if you are interested. In addition we must consider your National Grid connection – are you on single phase or three phase electricity? Currently up to 4kW (Total Installed Capacity) of solar PV can be installed on a single phase connection. Permission is required before installing a solar panel system larger than this size. We install domestic solar panels in the Bristol area as well as Gloucestershire, Wiltshire and Somerset. As you can see from the map, this is an excellent location for producing your own solar energy. 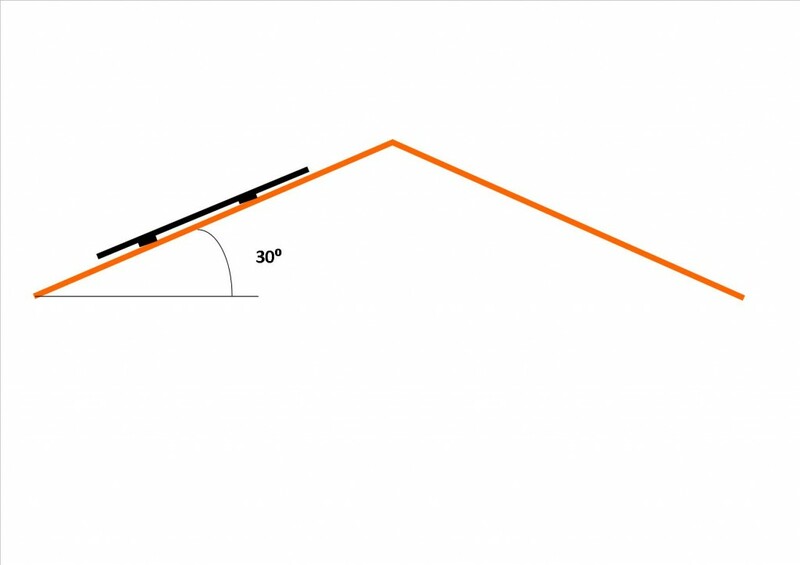 In the UK, a south facing roof is the best orientation for a solar panel installation. That said, east and west facing roofs can also perform well, generating around 85% of the electricity that a south facing system of the same size can produce. 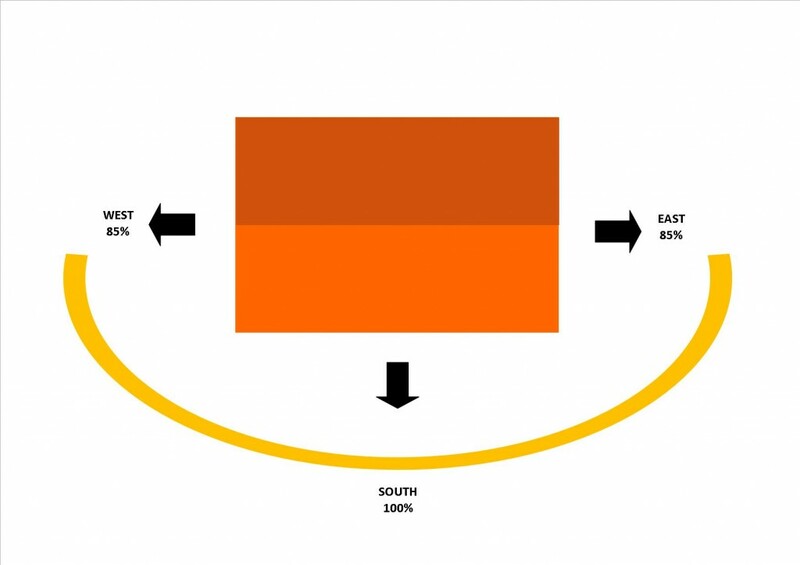 Another option is splitting the system so that half is on the east and half on the west. This will allow for good generation in both the morning and afternoon. A pitch of around 30° is optimal in the UK, although panels can be mounted on most surfaces. It is possible to install solar panels on flat roofs, provided that the structure is adequate. A frame is used to raise the panels to a suitable inclination. The structure of the roof is probably the single most important consideration when installing solar panels. An installer will need to provide detailed calculations both for structural loading (including the additional induced load from settled snow) and wind loading design. When asking for quotes the company should be able to tell you how this will be done and their qualifications for doing so. All structural calculations for Greenleaf Innovations installations are undertaken by qualified Engineers; Chris Kawecki holds a degree in Civil and Environmental Engineering and Dr Maciek Kawecki is a Chartered Engineer, PhD and an expert witness of the law society. For more information about how much space you require, I recommend that you download our free PDF – ‘Size Your Solar’. I personally think that you need to have a system of at least 2kW for the installation to be worthwhile. This will require at least 16m2 using standard efficiency polycrystalline panels. The inverter will require about 1.5m 2 for mounting, they are not this large, but require adequate space around them for airflow and heat dissipation. Garages are ideal for this, though ventilated roof spaces are often a good option. In order to access the highest rate of Feed In Tariff (FIT), you will need your property to be rated at a Band D or above at the time of your FIT application. The rating is determined by an Energy Performance Certificate (EPC) assessment. I recommend that you have your EPC done before you start work on your installation. The EPC can either be organised by you directly (we can liaise with your assessor) or we can arrange it for you.